It’s the official home of Liverpool supporters in Melbourne, but you’ll be well treated no matter whom you barrack for in the Melbourne CBD’s best pub for watching the Premier League. 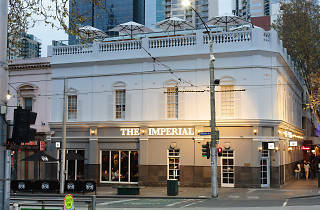 The Imperial stays open late for all the matches and keeps it classy, clean and comfortable with a traditional English pub vibe, and you can call ahead to book screenings of any sport you like. Staff are cheery and welcoming and the pub classics on the menu are high quality and great value, including a parma the size of a Frisbee. This year, they’ve also opened the city’s biggest rooftop, with handicapped access and amazing views over Parliament for unparalleled sunny day drinking. 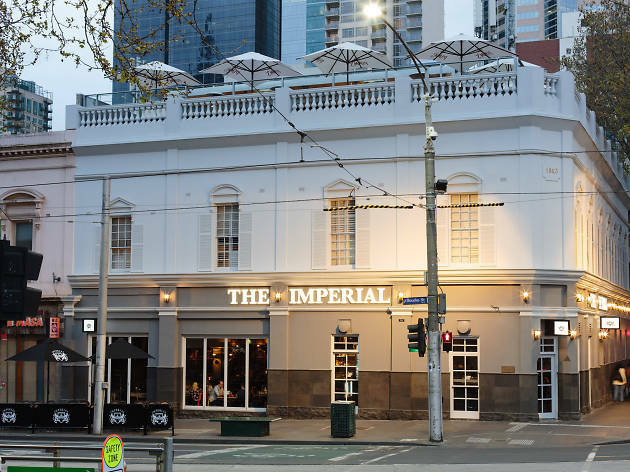 About a million taps pour pretty standard stuff, but with a view like this and a White Rabbit in hand, you’re kicking goals at the Imperial.